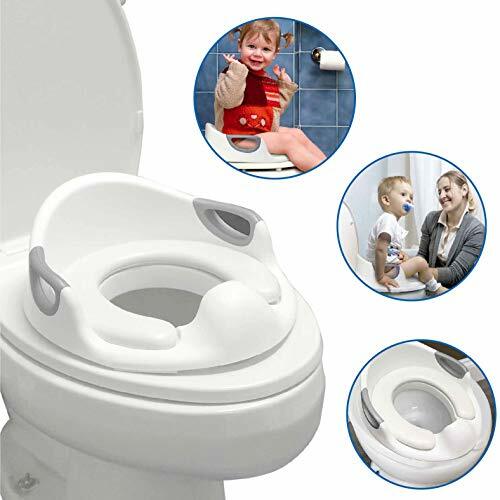 If you are looking forward to potty training your child, the best option for you is to invest in a durable, stable, and comfortable potty training toilet seat. Yet, finding one that fits you and your child’s needs and preferences is never easy. For that, we’ve got you covered. In this article, we are to discuss the features as well as the pros and cons of three of the best potty training toilet seats that are currently out in the market. The time will come in your child’s life when you want them to learn to be independent, especially when it comes to using the toilet. You can do this by encouraging them to go to the washroom on their own. For that, you would need a potty training seat that makes your child want to go alone. Fortunately, there are plenty of good options like the three we have reviewed in this article. This toilet seat aims to relieve parents from the tedious task of cleaning up after their children every time they go to the toilet. It comes equipped with features that will make your child confident enough to do things on his own. 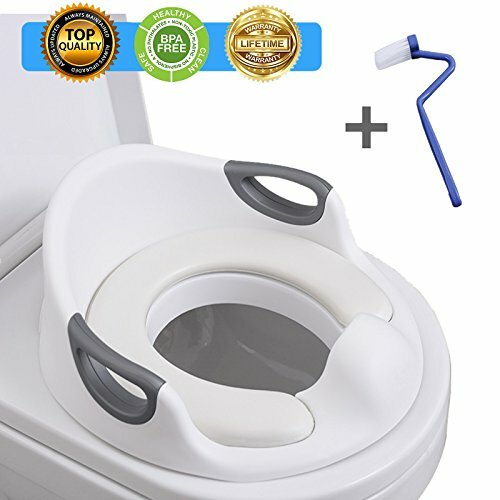 This potty training toilet seat comes with a backrest and a cushioned handrail. These features not only give better support to your child but also minimize the risk of your child falling. Apart from that, this toilet seat is also designed with four anti-slip rings and two pieces of an adjustable lever to secure the seat tightly on any toilet. This prevents the seat from wobbling and also encourages your child to use the toilet on their own. Cleaning up after your child can be very tiresome. This product is designed especially to make cleaning the toilet seat easy and efficient, leaving it hygienic in the shortest time possible. With the feature of a urine splash guard integrated into the seat, you won’t have any more accidents on the floor as it directs the flow into the toilet. This toilet seat also comes with a removable cushion design and no crevasses to prevent any germs from harboring, making it easier to clean. This product uses only the best materials for your child’s safety. Made from high-quality PP material and being BPA-free, this seat keeps everything environment-friendly. It also uses a highly elastic built-in sponge to ensure a comfortable experience for your child. This product is also manufactured to be durable yet lightweight at the same time. It only weighs about 1.3 pounds, which ensures that it is very portable. This is suitable for children aged one to seven. EasyGoProducts is a U.S.-based company that manufactures a wide range of items to help make our day-to-day life easier. Every purchase from this company helps support orphaned children in many countries. This potty training seat by EasyGoProducts is designed to fit all your child’s need by not only providing comfort while using the toilet but also safety during the process. This product offers adjustable handles to cater to your child’s safety needs while using the loo. With four non-slip strips also attached at the bottom, you will not have to fear your child toppling over. Apart from that, the EasyGo Potty Toilet Seat also comes with a comfortable cushion seat. This makes sure that your child gets encouraged to go to the toilet on their own. Designed with anti-splash features, this seat gives you the pee protection that you are looking for. Along with that, it also comes with the added feature of a removable backrest to provide you with easier access for clean-up. The best feature of this seat is that it is foldable. Therefore, it is travel-friendly and compact. You won’t have to worry about storage with EasyGo potty training seat. This toilet seat was manufactured to be portable with its lightweight built (about 1.66 pounds) and integrated handles. With a sturdy frame and a round design, you can attach the seat to any standard or even an elongated toilet seat. For every sale she makes, Jessa Leona sends a portion of it to unfortunate children in America to help feed and educate them. 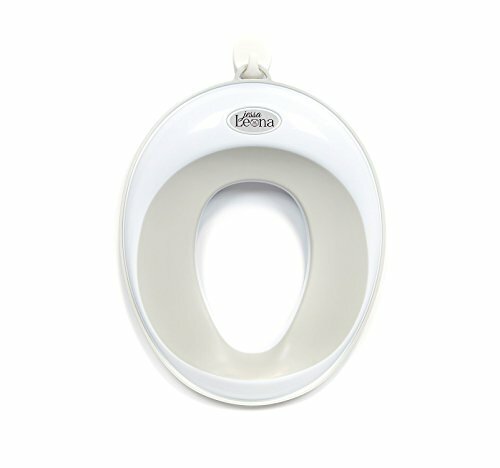 Jessa has designed this seat for those frustrated parents who cannot find a stable, simple, and affordable potty training toilet seat for their child. With integrated anti-slip rings, your child will not fear to go to the toilet independently. This toilet seat is manufactured to be the perfect size for your child to give a good bottom grip, ensuring there is no risk of falling over. Apart from that, this product has a firm seat that gives real toilet feels for an efficient transition from potty training seat to a real toilet. The toilet seat has a urine splash guard feature to avoid any mishap and to keep your toilet sanitary. Along with this, parents also find cleaning this seat easier because of its firm seat and the added bonus of having no crevasses. Therefore, you will not have to worry about germs harboring anywhere. Jessa Leone has built-in a handy, sturdy hook into this seat, which can hang the toilet seat on the wall or the toilet tank when not in use. This product also comes with a wall hook and a two-sided tape for attaching the hook. This ensures that you won’t have to go through the hassle of drilling! The seat is also made from a soft-to-touch material to keep your child comfortable while using the toilet on their own. It is also designed to fit most round and oval toilet bowls. Being lightweight at about 13.8 ounces, this potty training seat is surely portable. Summing up this review, we can see that all the toilet seats have their own unique features that make them some of the best potty training toilet seats in the market. However, we found that the EasyGo Potty Training Toilet Seat offers the most features at an affordable price. With this product, you get the added advantage of the seat being foldable and having a removable backrest, which you won’t get with the other two toilet seats. This makes clean up faster and easier. Along with these, this product also comes with a cushioned seat to give your child the most comfort while he is learning to be independent.